Authors: S. G. Parsons, B. T. Gänsicke, T. R. Marsh, et al. Why do we need M-dwarf radii? M-dwarf radii frequently exceed model predictions. Stars with these large radii are called “over-inflated.” While over-inflation sometimes indicates strong magnetic fields or rapid rotation, the authors point out that neither guarantees over-inflation, and over-inflation can occur without either of those conditions. They therefore seek some relationship between over-inflation and other fundamental stellar properties. Figure 1. 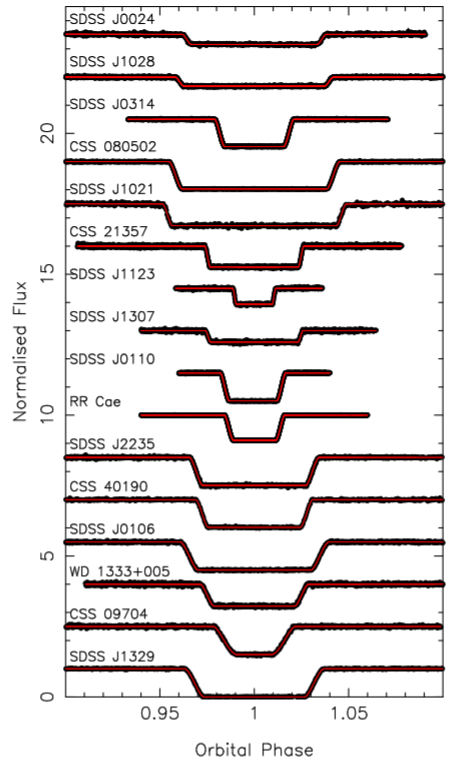 Light curves of the 16 studied white dwarfs as they are eclipsed by their M-dwarf companions. The light curves are arranged from the largest M-dwarfs at the top to the smallest at the bottom. Figure 2 in the paper. Using four different telescopes (the VLT, NTT, WHT, and TNT), the authors observed 16 different M-dwarfs in binary systems eclipsing their white dwarf companions. They also included data from 7 previously studied systems in their analysis. One of the advantages of white dwarfs is that they are compact but incredibly bright. An M-dwarf eclipsing a white dwarf therefore creates a significant drop in luminosity (Fig. 1). If we know the separation and orbital velocity of the system the drop readily reveals the M-dwarf radius. A team comprised of many of the authors of today’s paper actually published a different paper last year where they demonstrated that white dwarf models do an excellent job at capturing the fundamental characteristics of white dwarfs, including their mass and radius. Information about the white dwarf, including its temperature, allows the authors to determine the age of the binary system (and therefore the M-dwarf) with high precision. In addition to radius and age, the mass, spectral type, effective temperature, and metallicity of the M-dwarfs were all extracted through various processes. Once they acquired all that data, the authors began searching for relationships between the various measured quantities. Their primary question was whether the models accurately capture the relationship between radius and other fundamental characteristics. The answer is no. Not even remotely (Fig 2). When compared to model M-dwarfs of a given age, metallicity, mass, or orbital period, the real M-dwarfs had higher radii about 75% of the time. Unfortunately, this trend exhibits a huge amount of scatter with seemingly no dependence on any of the other quantities. Additionally, no detectable difference was seen between partially and fully convective stars and all the M-dwarfs, including the ones that were not over-inflated, were rapid rotators. Theses results confirm that some of the previously suggested culprits of over-inflation are not reliable predictors of the phenomenon. Figure 2. Radius of the M-dwarfs vs age (left) and metallicity (right). In both cases, the radius is given as a ratio of the value predicted by a model with the corresponding age or metallicity. Figures 8 (left) and 9 (right) in the paper. The conclusion of this paper might seem a little grim. It is a clear demonstration that our models are inadequate at predicting over-inflation in M-dwarfs, to the point of being insufficiently accurate for the analysis of exoplanets. Often in science, however, highlighting an important question is just as critical as discovering the solution. With the additional data provided by today’s paper–and a stern rebuke for anyone who blindly trusts the current models–we are hopefully that much closer to arriving at that solution.